I had my scrubber on for a 6 days so far and this is what I have. I just increased the lighting from 18/6 to 20/4 yesterday. 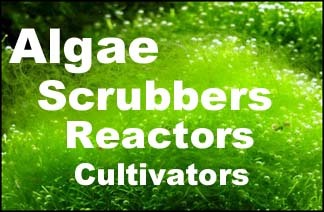 I did try to rub some hair algae in the scrubber. But, I don't think I did a good job and the progress still seems slow. I did take my protein skimmer, GFO, and carbon are all off line. Since the growth is occurring further down away from the light, and at the drains which have the most flow, this seems like it is needing more nutrients. So reduce the light to 12 hours. Anything I need to look for if that is not enough time to either increase or decrease my lighting? Always look to see if the growth in closer to or farther from the lights. This tells you what it is seeking. Also pay attention to the water flow; up at the holes, and down at the drains. This is where the most nutrients will be. I have hair algae on my rocks. If I stop feeding algae sheets. Will the tangs start eating the algae on the rocks? Interestingly, once your scrubber grows and pulls nutrients out of the water, phosphate will start coming out of the rocks and will cause more (not less) algae to grow on the rocks, thus feeding the tangs more. This will occur for about six months. And of course you can always feed the tangs from the scrubber, like I do. When they see the lid being raised (and the red light)... they come running for dinner. Well right now I have my scrubber in the sump. Do you think I will have a different affect if my scrubber was on top of the main tank and not in the sump? here is a with 8/16 and the last picture was when the tank had been dark for 24 hrs.